For more than a generation since Ronald Reagan’s takeout of air traffic controllers, unions have been taking it on the chin, in the shorts, and every other soft tissue place that can possibly hurt. And now as tech Uberizes everything in America, unions have little cred with young people who just want the personal freedom to do as they will. Unions, after all, represent rules and restrictions and everything seemingly bad and limiting. But then again, are union counterparts ever really “cool”? It’s the re-education of America. A new labor algorithm. This week, however, the standard rubric of labor and mortality prevailed. The good guys won again. Call it the short-term benefit of the 4-4 tie in the Supreme Court after the passing of the now non-voting, still late and lamented, Antonin Scalia. We all know how he would have voted in the case of Friedrichs v. California Teachers Association. He would have put the unions out of commission and taken them with him. At issue in the case is whether workers can be forced to join and pay dues for union activities done on their behalf. Workers, including those who didn’t want to pay up, as well as those who didn’t agree with the union, said it was an infringement of their First Amendment rights. The union claimed the workers, whether members or not, still got the benefit of its efforts. But it really needed a victory in this case. BSD (before Scalia’s death), the majority of the court was likely to have voted 5-4 against the Union. But the justice of the new math at 4-4 is different. 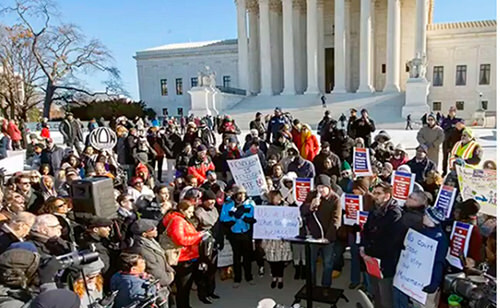 The equally-divided Supreme Court means that the judgment of the 9th Circuit Court of Appeals stands, upholding the union’s collection of fees from objecting teachers. Now we can point to the only gridlocked thing in Washington that still works. And we can look upon the existing “liberal” faction of Ginsburg, Breyer, Sotomayor, and Kagan in a different light. Four gets you somewhere in SCOTUS, at least for now. So hooray for the unions, indeed. But for those paying attention and not distracted by the latest Trump news or March Madness score, unions are still a hard sell in this era where technology, entrepreneurialism, and “right to work” has a ring of freedom that especially attracts young Asian Americans away from union anything. For me, as an American Filipino, I like to point out that the unions are in our blood. It always goes back to my Dad. When he came to the U.S. in 1928, he didn’t go to the fields. He found himself in San Francisco’s hotels and restaurants as a cook. The Cooks Union Local 2 was as strong as it got. Six years after his arrival, San Francisco had a general strike in 1934. That’s when the unions solidified their hold in the Bay Area. I can’t say there were never any problems. After 1965, when more Asians were allowed to immigrate to the U.S., the hotel and restaurant union was a stabilizing force in a new immigrant’s life. By then, the Cooks union had merged with the International Hotel and Restaurant Workers Union, which had become the biggest union in the city, given San Francisco’s tourism industry. The workers in San Francisco were a diverse group of Asians from China, Southeast Asia and the Philippines, mixed with those from Mexico. The union bosses were all bureaucrats from the ’30s and ’40s, who mostly spoke nothing but English and at times may have been no different from the work bosses. But in general, a Filipino cook standing up for his rights did a whole lot better standing with a kitchen full of workers banging on pots and pans, than he did standing alone in his chef hat and checkered pants next to a chopping block. Standing alone gets you crushed like garlic. Standing with your brothers and sisters, that’s the union. Sure, if you have a choice. You might get more. You might get less. But the argument for a union is that it can build a common base or floor, not a ceiling, that provides stability and fairness for everyone. At least that’s what my dad, the veteran pantry man, member of the Cooks Union Local 2, told me. It’s still as good a labor lesson that you can get. And this week, the United States Supreme Court still seems to agree, 4-4.